This natural galvanized tub with side handle is made of steel. 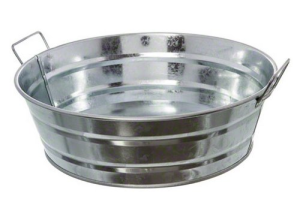 Galvanized tub is perfect for sandwiches or condiments and adds charm to service. Steel construction keeps this timeless tub from rusting so it will be useful at your catered events and parties. Its eye-catching and classic look adapts to any setting. Measures 10-inch diameter by 3-inch height.